Another Beautiful Day in Paradise. Well it was in the 70s with a little NE breeze and a little cloudy skies. We had quite a big group today. 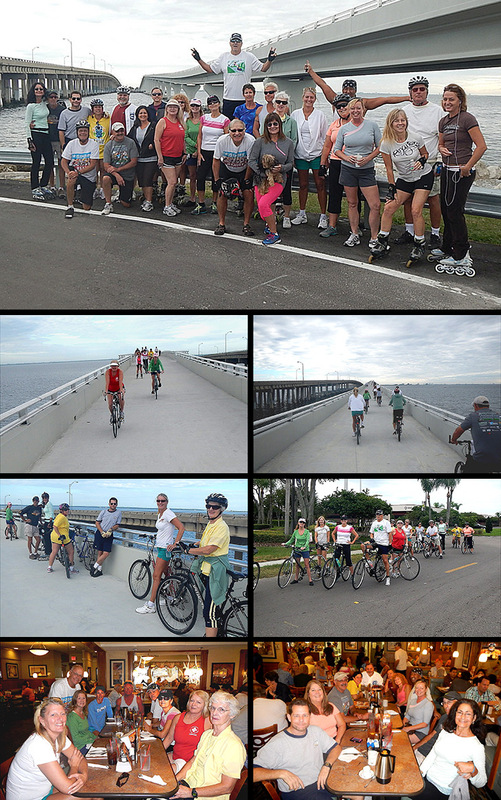 Blader/Bicyclers Theresa & Chris V, Dimitri F, Bruce M, Patrice H, Ross E (new), Rob & Amy H, Glenn & Sandy R, Deb B, Dorey Anne, Ginnie S & Rick P, Herb E, Yvonne, Terri S, Jim H, Carol J & daughter Dee G (new), Rick I & Laura P, Karen T, Cindy S, Roy H and Kathy C (new). We had a little parking problem but every one got a parking place. The route plan was to skate/bicycle East over the new Trail Bridge, look for some port-a-potties, go past Whiskey Joe's about 1 mile and return for ~10 miles. Once we got going, we couldn't get everyone to stop until we hit the East End (Cypress Point Park). This made for a round trip of about 13.5 miles. We had 7 bladers and 19 bicyclers. We Brunched at Perkins Family Restaurant as planned. Amy called ahead and made reservations for us. Thanks Amy. We got in after just a few minutes wait. We ended up with a table of 11 and a table of 9 people. Service was pretty good and they gave our table a coffee pot to serve our selves seconds. The food was a little pricey but they had a pretty good menu to pick from. We had ratings from 9 to 9.75. We'll given Perkins a 9.3.